We start to talk about this subject by language session first. Autonomation is a special terms in lean manufacturing concepts only. 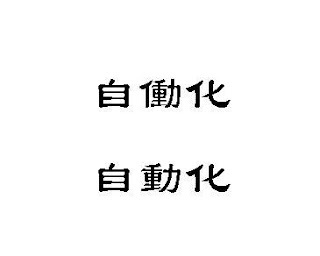 In Janpanese, autonomation is written in "自働化" or "Jidoka". In Chinese, there is only automation is written in "自動化"
In English, automation is meaning automatic motion, autonomation is meaning automatic NO motion. The concept is operating of the equipment will be stop automatic when its conditions achieved the limited of setting. The conditions can be considered in limit of quality or quantity. It may also be described as "intelligent automation" or "automation with human touch". Due to concept of "process focus", it makes possible the rapid or immediate address, identification and correction of mistakes that occur in a process. It was developed by earlier stage Toyota production system. At that moment, Toyota was developing the textile machine. Without the autonomation, when some wires broken, there was many defect product produced by the machine after final inspection. They came up a idea and improved the machine to detect if one of the wires broken, the textile machine will be stop automatically to prevent producing defect. After many years of implement, Toyota spread the idea to the process of automotive production and autonomation became a important principle of lean manufacturing. Autonomation is a quality control process used in the TPS which applies the following four principles. To detect the abnormality, It is a method of preventing errors by putting limits on how an operation can be performed in order to force the correct completion of the operation, called "POKA YOKE". The earlier stage of TPS, it called in "BAKA YOKE", means "fool-proofing" or "idiot proofing". It is obviously that not respect to people and disobeied the one of spirits of lean manufacturing. Afterward, they changed that to "POKA YOKE" and means "mistake-proofing" or "error-proofing". 1. The contact method identifies defects by whether or not contact is established between the device and the product. Colour detection and other product property techniques are considered extensions of this. 2. The fixed-value method determines whether a given number of movements have been made. 3. The motion-step method determines whether the prescribed steps or motions of the process have been followed. This the most important principle concerning quality in lean manufacturing system. It is also suitable for many kind of manufacturing industry!